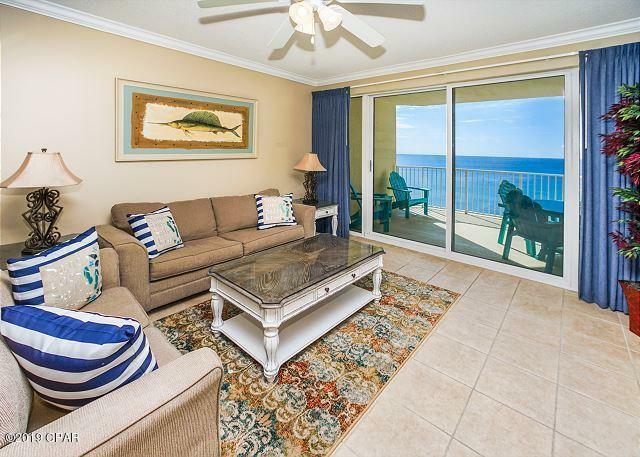 This renovated two-bedroom at Boardwalk Beach Resort sits on the 12th floor. The kitchen has upgraded cabinets and granite. This condo is finished nicely throughout. You will not need to redecorate this one after purchasing. Boardwalks amenities are second to none. This starts with the largest gulf front convention center in the area. You will also find a 24 hour onsite staff, gulf front zero entry pool, kids water play area, onsite restaurants and poolside bar, gulf front gym, wet and dry sauna, Boardwalks quality, floor plans and amenities make it one of if not the most complete condominium resort in Panama City Beach. The unit features wall to wall glass in the master bedroom, granite countertops, crown molding, nine-foot ceilings in the master and great-room, and tile throughout.